What is the difference between BIO water and natural spring or mineral water? 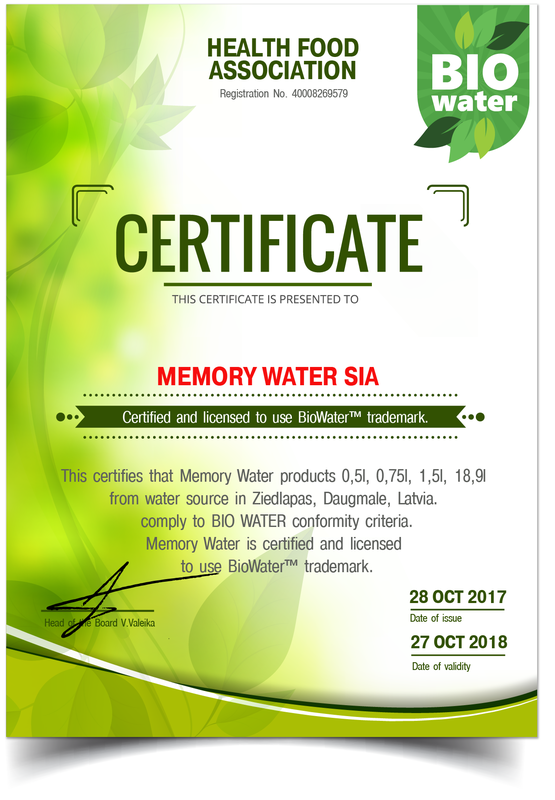 Memory Water is the first water from Northern Europe to receive the BioWater ™ certificate with full rights to use the BioWater ™ quality label. BIO water has higher quality and more natural requirements than the legislation places on spring water, mineral water and drinking water. In addition, high quality requirements are imposed not only on the water itself, but also on its packaging. Unfortunately, nowadays truly natural water has become a rarity. Most often water is diluted with reverse osmosis (distilled water), which significantly reduces both unwanted and at the same time necessary chemical elements, pH and significantly spoils the taste. The current European Union legislation supporting industrial products allows not only the drinking but also the natural mineral and spring water to undergo various manipulations - separation of unwanted chemical compounds, iron, sulfur, floura, manganese reduction, water conditioning, addition of ozonated air, treatment with sodium hydroxide, treatment with acid, rinsing with drinking or demineralized water, etc. It is apparently doubtful whether, after such treatment complex water should be considered natural in the sense of the consumer. Rather, such water would be called water product. Therefore, there is a need to obtain a higher quality standard certification, which actually meets the consumer's understanding of a truly natural BIO product. Similar water BIO certification is also carried out in other parts of European Union, for example, in Germany. Memory Water as a BIO product is unique because only mechanical filtration is necessary to reduce the presence of sand and clay particles. No other type of filtering, disassembly, rinsing, separation, conditioning or other chemical interference is not required and to comply with the the BIO product standard is strictly prohibited. Both the place of production and the product must not contain parasites, pathogenic micro-organisms, and viable microorganisms that indicate the presence of faeces. No treatment of any kind allowed to reduce these indicators. Separate iron, manganese, sulfur and arsenic compounds by treatment with ozone-enriched air. Rinsing with drinking or demineralised water and conditioning with the water as the final step in order to ensure that the filter has no impact on the overall mineral content of the treated water. Separate carbon dioxide (carbon dioxide) or reduce its content by physical methods. Use ozone-enriched air for treatment of natural mineral water and spring water. Add carbon dioxide (carbon dioxide).